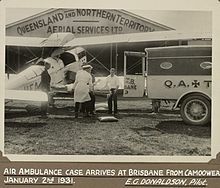 One of the original De Havilland DH.50 machines used flown by Qantas, in this case doing ambulance work, delivering a patient at Brisbane in 1931. The Royal Flying Doctor Service of Australia (RFDS, informally known as The Flying Doctor) is one of the largest and most comprehensive aeromedical organisations in the world. It provides emergency and primary health care services for those living in rural, remote and regional areas of Australia. It is a non-profit organisation which provides health care to people who cannot access a hospital or general practice due to the vast distances of the Outback. The Reverend John Flynn had worked in rural and remote areas of Victoria and was commissioned by the Presbyterian Church to look at the needs of Outback people. His report to the Presbyterian Assembly in 1912 resulted in the establishment of the Australian Inland Mission (AIM), of which he was appointed Superintendent. In 1928, he formed the AIM Aerial Medical Service, a one-year experiment based in Cloncurry, Queensland. This experiment later became The Royal Flying Doctor Service. Flynn's missionary work involved the establishment of hospitals in bush communities. This, however, did not help those who lived far from any major community. In his public speaking he would often retell the tragic circumstances that had befallen several bush settlers. The fate of Jimmy Darcy, in 1917, was one of these stories. Darcy was a stockman at Ruby Plains, a remote cattle station in Western Australia. After being found injured, with a ruptured bladder, by some friends, he was transported over 30 miles (12 hours), to the nearest town, Halls Creek. Here, Darcy was met by FW Tuckett, the Postmaster, and the only man in the settlement trained in first aid. Tuckett said there was nothing he could reliably do for injuries so serious, and tried unsuccessfully to contact doctors at Wyndham, and then Derby, by telegraph. He eventually got through to a doctor in Perth. Through communication by morse code, Dr Holland guided Tuckett through two rather messy bladder operations using the only sharp instrument available, a pen knife. Due to the total absence of any medical facilities, Darcy had been operated on strapped to the Post Office counter, having first been made insensible with whisky. Holland then travelled 10 days to Halls Creek on a boat for cattle transport, a Model T Ford, a horse-drawn carriage, and even on foot, only to find that Darcy had died the day before. The operations had been successful, but the stockman had died from an undiagnosed case of malaria and a ruptured abscess in his appendix. It was from stories such as this that Flynn, and his following at the AIM, became inspired to develop a route of communications that could solve the problem of remoteness. However, no feasible technology seemed apparent. Victorian pilot Lieutenant (John) Clifford Peel had heard Flynn's public speeches, and on being shipped out to France for World War I in 1917, sent Flynn a letter explaining how he had seen a missionary doctor visiting isolated patients using a plane. Assisted by costing estimates by Peel, Flynn immediately took the idea of using aircraft to begin his idea, and published Peel's idea in the church's newsletter. Peel died in combat in September 1918, probably not even knowing the impact he had in the creation of an Australian icon. Along with motorised flight, another new technology was being developed that could replace the complicated means of communication by telegraph. Together with Alfred Traeger, Flynn began experiments with radio in the mid-1920s to enable remote outposts to contact a centralised medical base. The pedal radio was the first result of this collaboration. These were distributed gradually to stations, missions and other human residences around Cloncurry, the base site for a 50-watt transmitter. Experimental aerial medical services commenced in 1926 and an injured miner was transported by air from Mount Isa to Cloncurry in November 1927. By 1928, Flynn had gathered sufficient funds through fundraising activities to launch the experiment of the AMS on 15 May. 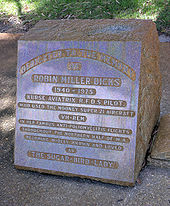 Its supporters included industrialist HV McKay, medical doctor George Simpson, and Hudson Fysh, one of the founders of Queensland and Northern Territory Aerial Services, the company which would go on to become Qantas. Qantas supplied the first aircraft to the fledgling organisation, VH-UER a De Havilland DH.50, dubbed "Victory". On 17 May 1928, two days after inception, the service's first official flight piloted by Arthur Affleck departed from Cloncurry, 85 miles to Julia Creek in Central Queensland, where the plane was met by over 100 people at the airstrip. Qantas charged two shillings per mile for use of the Victory during the first year of the project. Within the first year of operations, the service flew approximately 20,000 miles in 50 flights, becoming the first comprehensive air ambulance service in the world. The service persisted through difficult first years, dealing with postwar Australia and the Great Depression of the 1930s. During its first few decades the service relied heavily on community fundraising, volunteer support and donations. Nowadays, the service is supported by the Commonwealth, State and Territory Governments, but still relies heavily on fundraising and donations from the community to purchase and medically equip its aircraft, and to finance other major capital initiatives. Until the 1960s the service predominantly hired aircraft, pilots and service technicians from contractors. After this point, the service moved on to purchasing its own equipment and employing its own pilots and mechanics. In 1932, the success from its operations in Cloncurry, and the increasing public awareness to this vital rural service, resulted in a push for a national network of flying doctors, hopefully with sponsorship from the government. In 1934 this was realised with the new Australian Aerial Medical Service opening up "Sections" across the nation. Bases were set up in Wyndham, Port Hedland, Kalgoorlie, Broken Hill, Alice Springs and Meekatharra. The Queensland experiment was expanded with two additional bases opening in Charters Towers and Charleville. An official Federal Council for the organisation was formed in 1936. In 1937, Dr Jean White became the first female flying doctor in Australia, and the world, when she started work at Normanton. In 1942 the service was again renamed as the Flying Doctor Service, with Royal being bestowed upon the service in 1955. On 22 October 1958, Holden car manufacturers donated their 500,000th vehicle to the service in Melbourne. Sister Myra Blanch was one of the first nurses, known as "Flying Sisters", to join the service. She was key in the New South Wales Section operations during the 1940s and 50s, even though Flying Nurses didn't actually become regular until the 1960s. Many patient transports are conducted with an RFDS nurse and pilot only on board. Nurses have been responsible for many innovations to the service, including an addition to the RFDS medical chest to incorporate a "body chart" (1951). The chart was an anatomical representation of a human being, with areas clearly numbered. With such a chart, a remote doctor can ask the patient "where is the pain felt?" and receive a comprehensible reply. The medicines contained in the chest are similarly numbered for ease in communicating medical instructions. 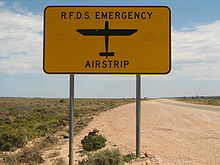 A sign on the Eyre Highway indicating that an RFDS emergency airstrip is ahead. There are four such strips on the highway. The service is still heavily reliant on community support for funding, and is well respected across the country as an organisation that has contributed much to rural, regional and remote communities. Primary health care clinics – the transportation of a general practitioner for regular clinical visits to remote areas (often a circuit visiting several communities and/or stations). Clinics include general practice, nursing services, child and maternal health, Aboriginal and Torres Strait Islander health, Rural Women's GP Service, mental health, dental services, allied health and medical specialists. The service also uses not just aircraft but also four-wheel drives and other utility land vehicles to aid in transportation and communications. The RFDS is made up of seven legal entities – RFDS of Australia, Central Operations, Queensland Section, South Eastern Section, Tasmania, Victoria and Western Operations. The RFDS operates in a federated structure and each of the seven entities has its own Board and Management. Each entity operates independently, both financially and operationally. The Flying Doctor operates from numerous bases, health services and other facilities (including marketing, fundraising and public relations as well as the national office) across Australia. Central Operations – with bases at Adelaide Airport, Alice Springs Airport and Port Augusta Airport, and health services at Andamooka, Marla and Marree. South Eastern Section – Broken Hill, New South Wales; Dubbo, New South Wales; Launceston, Tasmania; Essendon Airport; and Sydney Airport and Bankstown Airport in Sydney. Victoria Operations - bases across the state, including Richmond, Maffra, Essendon Airport; Mildura and Wangaratta. The Victorian Section office is in Richmond, an inner eastern suburb of Melbourne. Western Operations – Broome, Kalgoorlie, Meekatharra, Perth's Jandakot Airport, and Port Hedland. The Rio Tinto LifeFlight jet is located at Perth Airport. Bases at Carnarvon, Geraldton, Derby, and Wyndham have closed, while the original base at Cloncurry was moved to Mount Isa in 1965 and the early base at Charters Towers moved to Cairns in 1972. The most recent new base was opened in Broome in 2016. The first aircraft operated by the "Aerial Medical Service" in 1928 was a de Havilland DH.50 hired from the fledgling Queensland and Northern Territory Aerial Service (Qantas). It was replaced in 1934 by a DH.83 Fox Moth. During the 1930s and 1940s the fleet consisted of a mix of de Havilland DH.50s, DH.83 Fox Moths, DH.84 Dragons, DH.104 Doves and the de Havilland Australia DHA-3 Drover. From the 1950s to 1970s, the fleet included the Beechcraft Baron, Beechcraft Travel Air, Beechcraft Queen Air, Beechcraft Duke, Cessna 180, Cessna 182, Cessna 421, Piper Cherokee and Piper PA-31 Navajo. Aircraft were provided by contractors until the 1960s. Subsequently, the RFDS owned its own aircraft and employed its own pilots and engineers. Preserved GAF Nomad on display at the RFDS base Broken Hill. This was not an actual RFDS aircraft but has been repainted to represent one of the Nomads based there. A Hawker 800XP2 at Broome Airport. The aircraft is sponsored by Rio Tinto Group. In the 1970s and 1980s the RFDS base at Broken Hill operated the Australian-made GAF Nomad. From the 1980s to 2000s, the fleet included the Cessna 404 and Cessna 441. For a time in the mid-2000s the aeromedical evacuation aircraft used were either the Pilatus PC-12 or the Beechcraft King Air 200 series. The internal configuration of these two aircraft varies in the different RFDS sections. Typically they are configured with two rear-facing seats which look onto two stretchers. In some aircraft, one stretcher can be removed quickly and two seats slipped into place instead. Both the PC-12 and King Air are pressurised and so can be used to safely transport patients who would not otherwise tolerate the decreased atmospheric pressures involved in non-pressurised aircraft. By flying at a lower altitude than usual, the internal cabin pressure can be maintained throughout the flight at sea level. This is important for patients critically sensitive to pressure changes. In addition, pressurised aircraft can fly at a sufficiently high altitude to be above turbulent weather conditions. This is of great benefit in providing an environment safe for the patient and staff, and also limits complications of aeromedical transport such as motion sickness and exacerbation of injuries such as unstable fractures. In October 2009 the standardisation on the two aircraft types ended when two Cessna 208B Grand Caravans and a Hawker 800XP joined the fleet. Pilatus PC-24 2 5 (3 Strechers) 6 Purchase rights for 4. 3rd on order. The South Eastern Section operates 18 King Airs (9 B200, 7 B200C and 2 B300C); the Queensland Section operates 16 King Airs (8 B200, 6 B200C and 2 B200SE), 3 PC-12s and the 2 Grand Caravans; Western Operations operates 15 PC-12s and the Hawker 800XP; and Central Operations operates a PC-12 fleet numbering 14 aircraft. The RFDS uses a wide range of contemporary emergency medical equipment to provide aeromedical retrieval services. These include transport ventilators, critical care monitors, infusion devices, point-of-care testing, portable diagnostic ultrasound and a range of other splints and devices. The School of the Air, which links outback students with centralised teachers, until recently used the same radio equipment as the RFDS. This has been superseded with the availability of internet services. The RFDS was the subject of the TV drama series The Flying Doctors. The series followed the lives of an RFDS crew based in a fictional township called "Coopers Crossing" and the members of the local population that they served. In the 1950s the RFDS featured in a BBC Radio series The Flying Doctor, which became well known for the catchphrase "Flying Doctor calling Wollumboola Base". A television show of the same title based on this radio series and starring Richard Denning ran on the British ITV network for one season (1959–60). At the closing of Charlie Drake's humorous song "My Boomerang Won't Come Back", it is implied that the narrator accidentally downs a Flying Doctor plane with his boomerang. The Royal Flying Doctor Service of Australia is featured in the outback map of the video game Flight Control. The British space rock group Hawklords released a song called "Flying Doctor" on their album 25 Years On (1978). It describes an Australian flying doctor who has a drug cabinet key. In the television series Thomas & Friends, Season 22 introduces Isla, a plane in service to the RFDS, who is good friends with Shane, the Australian engine Thomas first met back in the special Thomas & Friends: The Great Race. The episode Cyclone Thomas has Isla shown flying to various medical emergencies with her on-board doctor, Dr. Claire, and attempting to help evacuate residents from a town threatened by a hurricane. 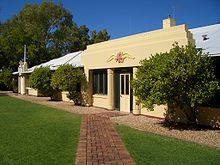 The First and Second Australian Inland Mission Hospitals in Birdsville are listed on the Queensland Heritage Register. In 2009 as part of the Q150 celebrations, the Royal Flying Doctor Service was announced as one of the Q150 Icons of Queensland for its role as an iconic "innovation and invention". In 2011 the Royal Flying Doctor Service of Australia (Queensland Section) was inducted into the Queensland Business Leaders Hall of Fame in recognition of its iconic contribution to rural health and rural community building in Australia through exceptional standards of service and innovation. ^ Simpson, George (12 November 1927). "Medical Services in Inland Australia". Medical Journal of Australia. 2: 697–700. ^ Vickers, Allan (1 February 1936). "Australian Aerial Medical Services". British Medical Journal (Suppl): 47–50. ^ Smith, Neil. "Lt. John Clifford Peel, Australian Flying Corps". 3 Squadron, Australian Flying Corps and Royal Australian Air Force. Archived from the original on 20 August 2014. Retrieved 27 June 2014. ^ "FLYÏNG DOCTORS. INLAND MISSION. CLONCURRY AS A BASE". The Brisbane Courier. 2 November 1927. p. 11. Archived from the original on 8 August 2017. ^ a b c "RFDS Aviation History and Early Aircraft". flyingdoctor.org.au. Archived from the original on 29 January 2013. Retrieved 9 January 2013. ^ Langford, Stephen (4 July 1994). "The Royal Flying Doctor Service of Australia. Its Foundation and Early Development". Medical Journal of Australia. 161 (1): 91–94. ^ "First woman flying doctor". The News. XXIX (4, 373). South Australia. 29 July 1937. p. 1. Retrieved 20 January 2018 – via National Library of Australia. ^ a b c d Langford, Stephen (2015). The Leading Edge. Innovation, technology and people in Australia's Royal Flying Doctor Service. Perth: University of Western Australia Publishing. ISBN 9781742588148. Archived from the original on 29 July 2017. ^ "RFDS Your Health – Health Services". flyingdoctor.org.au. Archived from the original on 6 February 2013. Retrieved 9 January 2013. ^ "RFDS Health Professionals website". flyingdoctor.org.au. Archived from the original on 11 February 2013. Retrieved 9 January 2013. ^ "RFDS governance". Royal Flying Doctor Service of Australia. Archived from the original on 19 March 2018. Retrieved 21 September 2018. ^ a b "RFDS About Us". flyingdoctor.org.au. Archived from the original on 3 March 2016. Retrieved 19 April 2016. ^ "Rio Tinto Life Flight". Royal Flying Doctor Service of Australia. Archived from the original on 16 February 2011. Retrieved 1 January 2011. ^ Langford, Stephen (7 December 2009). "The first medical jet aircraft for the Royal Flying Doctor Service". Medical Journal of Australia. 191 (11): 609–610. Archived from the original on 12 April 2012. Retrieved 21 December 2009. ^ a b RFDS Annual Report 2015/16 (PDF). Sydney, Australia: RFDS of Australia. 30 June 2016. Archived (PDF) from the original on 13 April 2017. ^ "World-first aero medical PC-24 jet lands in WA | Royal Flying Doctor Service". www.flyingdoctor.org.au. Retrieved 21 March 2019. ^ "Retrieval Equipment". Royal Flying Doctor Service of Australia. Archived from the original on 2 April 2016. Retrieved 14 June 2015. ^ Knight, Ken G. Affleck, Arthur Herbert (1903–1966). Australian Dictionary of Biography. National Centre of Biography, Australian National University. Archived from the original on 28 July 2014. Retrieved 14 April 2018. ^ "Royal Flying Doctors SE - Patrons". Royal Flying Doctor Service of Australia. Archived from the original on 13 April 2018. Retrieved 14 April 2018. ^ "Royal Flying Doctors - Reverend John Flinn". Royal Flying Doctor Service of Australia. Archived from the original on 25 October 2009. Retrieved 14 April 2018. ^ "The Flying Doctors (TV Series 1986–1994)". Internet Movie Database. Archived from the original on 14 April 2018. Retrieved 9 January 2013. ^ "The Flying Doctor (TV Series 1959– )". Internet Movie Database. Archived from the original on 24 October 2012. Retrieved 22 March 2013. ^ < "Firemint Honors Australia's Royal Flying Doctor Service With Flight Control Update". just another mobile monday. 11 September 2009. Retrieved 14 May 2012. ^ "Royal Hotel/Australian Inland Mission Hospital (former) (entry 600459)". Queensland Heritage Register. Queensland Heritage Council. Retrieved 1 August 2014. ^ "Australian Inland Mission Hospital (former) (entry 602635)". Queensland Heritage Register. Queensland Heritage Council. Retrieved 1 August 2014. ^ "Royal Flying Doctor Service of Australia (Queensland Section)". Queensland Business Leaders Hall of Fame. Archived from the original on 16 August 2017. Retrieved 13 September 2017. Audio slideshow: Outback Australia- The royal flying doctor service. Carl bridge, head of the Menzies Centre for Australian studies at King's College London School of Medicine, outlines the history of this service.